The United States has called for an end to violence in the Libyan capital Tripoli, as military strongman Khalifa Haftar, who cut his teeth fighting for former leader Muammar el-Qaddafi, sets his sights on the country’s seat of power. In a statement released by the State Department Sunday, Secretary of State Mike Pompeo said the United States was “deeply concerned” by escalating violence near Tripoli, urging a cessation of hostilities between Haftar’s self-styled Libyan National Army and a coalition of militias arrayed against him in Tripoli. 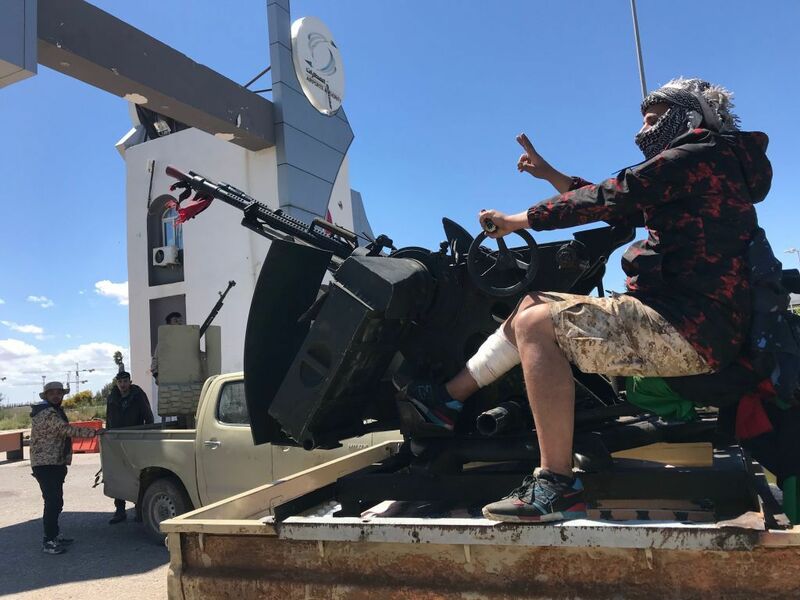 Some of the worst fighting seen in the Libyan capital since the country’s 2011 revolution and subsequent NATO intervention, ending Qaddafi’s 42-year rule, erupted at the end of last week as Haftar’s forces began their assault on the outskirts of southern Tripoli. Tripoli’s health ministry announced that at least 30 combatants and civilians had been killed since fighting began on April 4. A medical coordinator for a Tripoli-based charity, speaking on condition of anonymity, told Newsweek that the city’s hospitals were preparing for additional casualties. “The Ministry of Health now are preparing the hospitals near the zones where clashes are taking place, south of Tripoli,” the coordinator said over the phone from the embattled city. There was a brief lull in fighting earlier this morning, but in midafternoon Haftar’s forces launched airstrikes against Tripoli’s only functioning civilian airport. The medical coordinator said multiple blasts could be heard across the city during the attack. “We heard, at most, four explosions,” he said, adding that low-level clashes could be heard throughout the day but there had been an uptick in violence in the afternoon. According to the Associated Press, no casualties were reported following the air assault. In a statement, the Libyan branch of the International Federation of Red Cross and Red Crescent Societies said it had evacuated 12 families from the district of Ain Zara. The U.N. humanitarian coordinator in Libya said a total of 2,800 people had been displaced by fighting in Tripoli, with the clashes cutting off access to some areas for the emergency services. A front line pushing toward central Tripoli now extends from the neighborhoods of Suq al-Khamis, Suq al-Ahad, Ain Zara, Wadi Rabia and Aziziya on the outskirts of southern Tripoli. Prior to the strikes on Mitiga International Airport, fighting had centered around the strategically important Tripoli International Airport, which was destroyed in clashes in 2014. Since 2014, Haftar, allied with an eastern government in Tobruk which rivals the country’s U.N.-backed Government of National Accord in Tripoli, has grown in stature in beleaguered post-Qaddafi Libya. A deeply divisive figure within the country, Haftar fought alongside Qaddafi before plotting to overthrow him from the late ’80s onward. In opposition to Qaddafi, Haftar sought refuge in the United States before fighting against the so-called brother leader during the 2011 revolution. Just under five years ago, Haftar fought a protracted ground war against Islamist militants in the east of the country, eventually wresting control of Libya’s second city, Benghazi. In recent months, his forces have swept across the south of the country with little opposition. Maha Ellawati, a Libyan journalist and analyst, told Newsweek that while Haftar was attacking from a position of strength—securing 70 percent of the country’s territory—already the assault has not gone according to plan. “When Haftar took control of the south of Libya, he grew stronger… However, he thought the militias in Tripoli would side with him, but they refused,” Ellawati explained. Another Tripoli resident, also speaking on condition of anonymity, told Newsweek the population in the country’s capital was concerned that the destruction meted out to Benghazi during Haftar’s yearslong battle there would be imposed on them.